whole life that doesn’t have its splash of happiness? Belted Kingfisher photographed mid-hover, on a cloudy day over Puget Sound in Seattle. Processed in Silver Efex Pro. 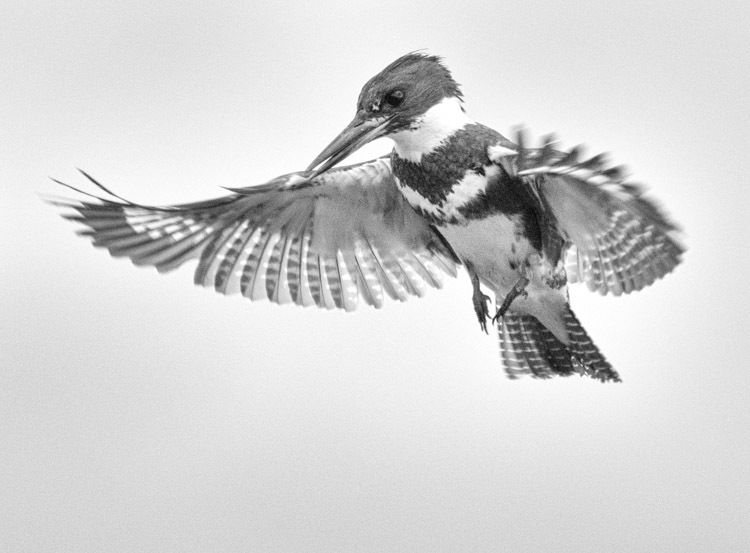 Thank you for catching this handsome Belted Kingfisher in his hovering-before-diving pose, enabling me to NOT think about what he is born to NOT think about, according to poet Mary Oliver! I hope Bea Elliott checks out geography: Elliott Bay! I like “Taylar” — it’s stands out from the many Taylors, and I can pronounce it (unless I’m supposed to be saying it “lar” as it’s spelled? I just say “Tay-lor”!). Amazing photos Ingrid! Love those in-flight, hoovering shots! From what I gather at wiki s/he seems to be female… Yes? And in this case it’s almost odd/rare that she would be more adorned than her male counterpart. In any case – he/she is gorgeous. Yes, tough to tell in black-and-white, but the female Belted Kingfisher has a rust-colored band underneath the blue one on her breast, and sort of a rusty-colored vest (what I call it). The male would have just the single blue band and white breast. You’re right that it’s the less common form of sexual dimorphism (different appearance between the sexes). Generally, it’s the male who’s more colorful or ornate. Thanks, Larry. And yes, I needed an excuse for that snippet from Mary Oliver. I like the action detail. 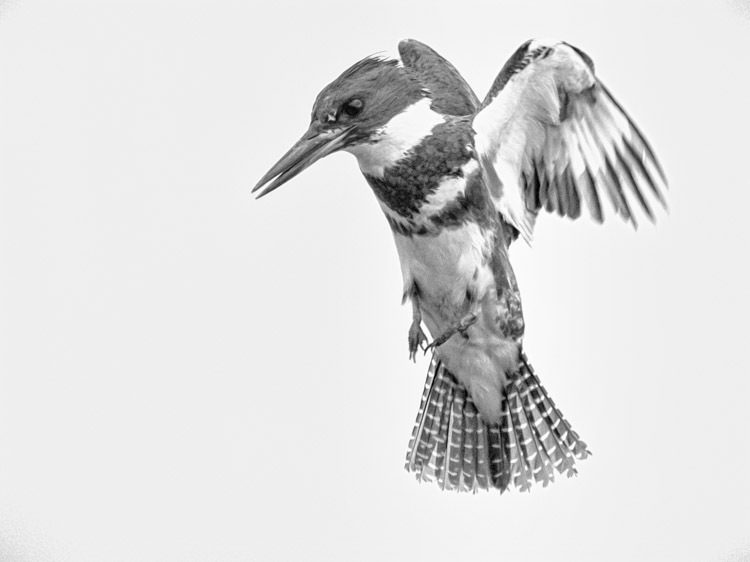 You did a sequence of Kingfishers at some other post which were amazing; (like multiple exposures put together). I’ve seen them here too, but too elusive to shoot. Maria, thank you for remembering that. Yeah, I captured another kingfisher in flight (similar location) and was able to create a composite from the different poses in the flying and hovering. They are incredibly elusive. I find I can photograph them when they are intent on something in the water, either perched or hovering. Last year, I watched a beautiful, excited display of young Belted Kingfishers just out of the nest (nearby to home here), and all four family members were circling around overhead in a way that was difficult not to interpret as exuberance. Now *that* was tough to photograph, they’re so fast and were a bit too far away. I got one or two passable shots from that event.